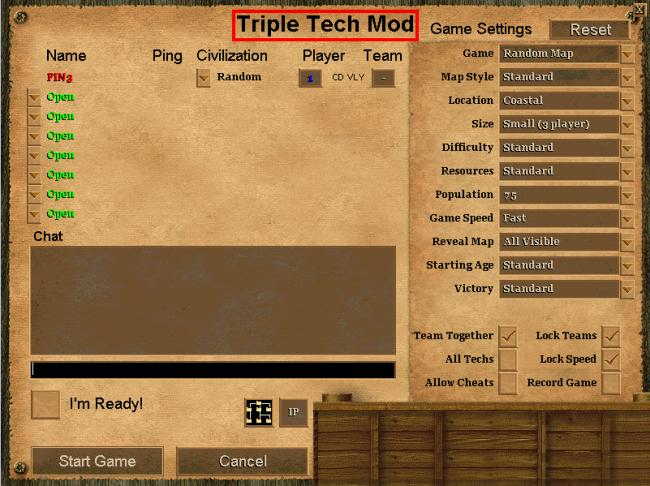 This mod triples each technology and civ bonus in the game. This slight change makes for some very different game play. Try using siege units as Mongols or Archers as Britons! The name of the mod has been added to the game's multiplayer screen, this is to ensure that players understand that the mod is being used. This mod is not rated. Here below is an total list of fixes and some techs have been balanced to 2x instead of 3x to prevent too extreme outbalancing effects like chinese techs almost cost nothing and maya resources last forever. Stats bonusses like fast mongol siege, ultra french paladin have been left in tact.